"That's OK, we'll handle this ourselves." labor union. 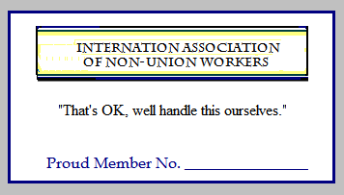 The IANUW gives ALL non-union workers a voice in matters that concern workers everywhere. How many non-union workers are there in the United States? working persons who are non-union. How much influence might the IANUW have? How can I join the IANUW? encourage others to look at this statement, and comment, or criticize, or join. more grass roots than 245 million non-union workers, with no union bosses. By far the largest workers' organization in the world.